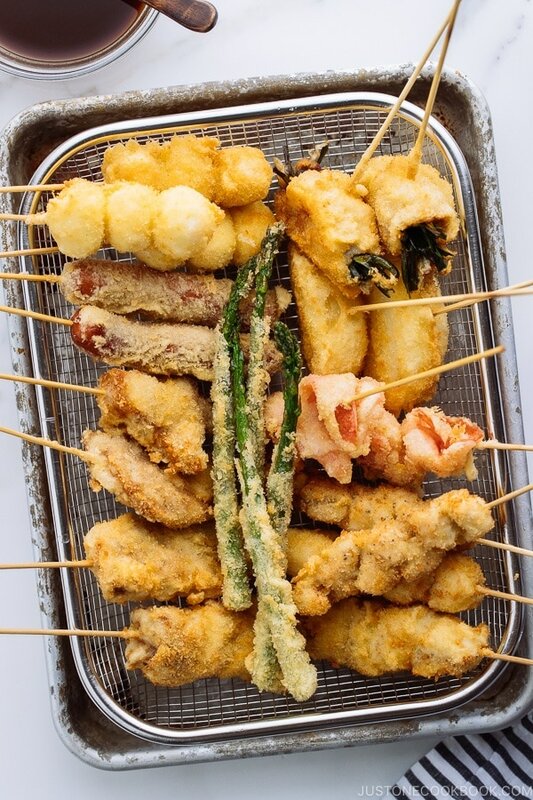 A hugely popular Osaka street food, Kushikatsu (Kushiage) are skewered meat and veggies that are breaded with panko and deep fried to golden crisp. Dip in a savory sauce to enjoy! When we were in Osaka this past summer, one of the local specialties that we enjoyed most was Kushikatsu (串カツ) also known as Kushiage (串揚げ). 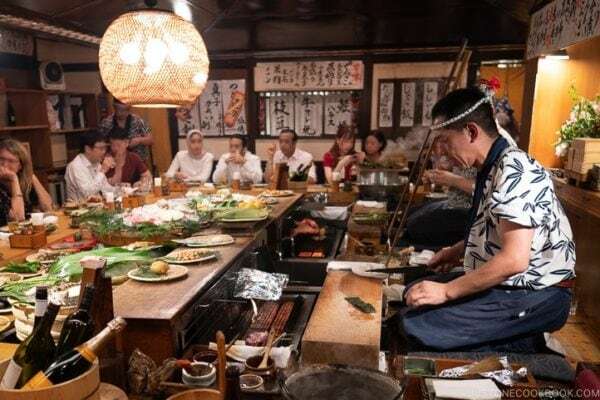 Similar to hot pot, there is a sense of communal eating with kushikatsu, where you are sitting or standing side-by-side with other diners, partaking in the enjoyment of the good eats, the dunking of the sauce, the lively chatters and the casual yet super fun atmosphere. 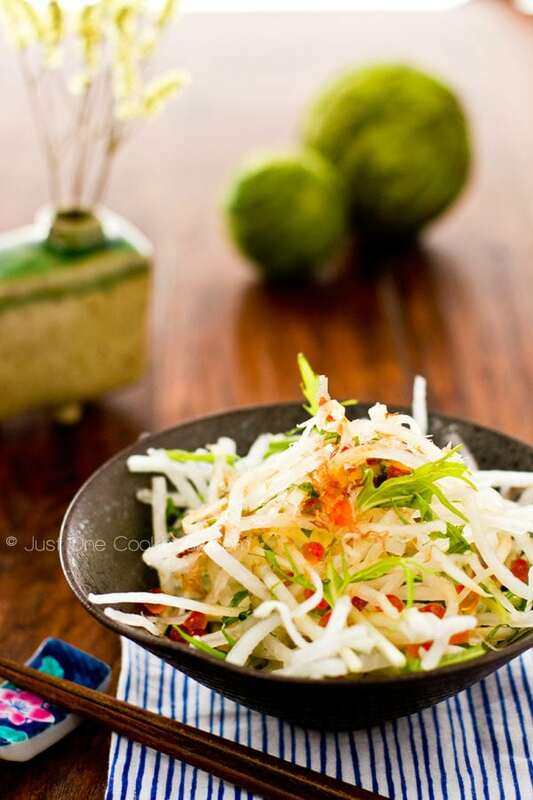 Today we’ll make this street food from the comfort of our own home! 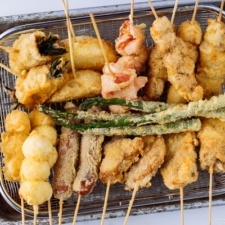 Kushikatsu (串カツ), also known as Kushiage (串揚げ), are deep fried panko crusted meat and vegetables on bamboo skewers called Kushi. As you may already know katsu refers to cutlet and age means deep fried. 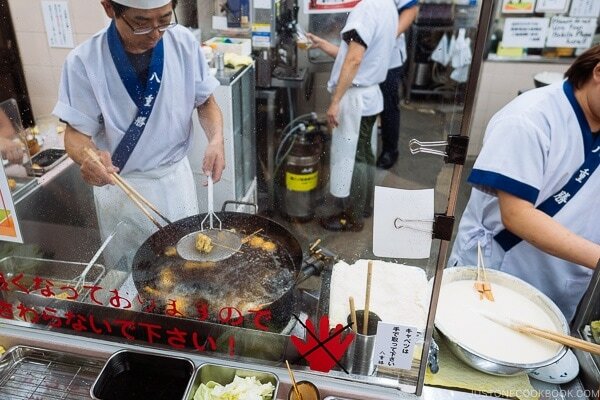 There are Kushikatsu specialized restaurants (or stands) with just counter seatings that sell these deep fried skewers all over Japan, especially in Osaka. Originated in the early 1900’s in Osaka, Kushikatsu was considered as a fast food as they were easy to eat, cheap, and fulfilling. 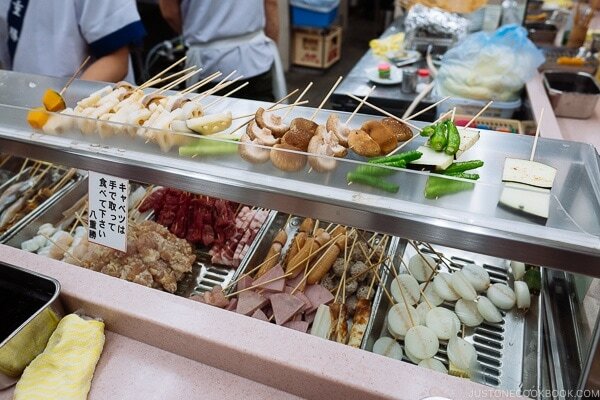 There are a wide selection of food ranging from meat to vegetables and seafood skewered on sticks, all laid out on large trays for you to choose from. You would make the order directly to the chef (or the vendor) by picking out the ingredients you want to eat. The chef would then dip the skewers in the egg and flour batter, lightly coat them in panko breadcrumbs, and deep fry right in front of you. 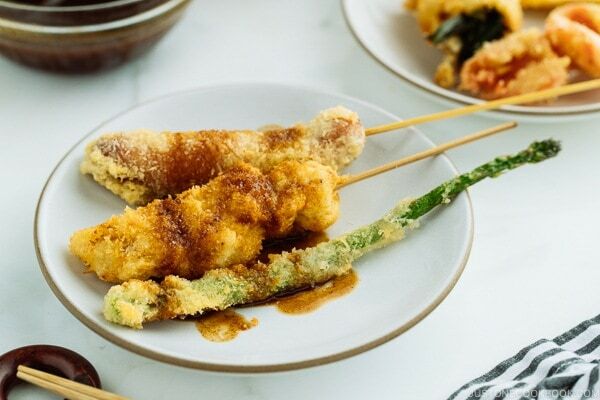 Once the foods are cooked, they are served straight to you piping hot and before eating you dunk the kushikatsu into a shared sauce pot of thin sauce. 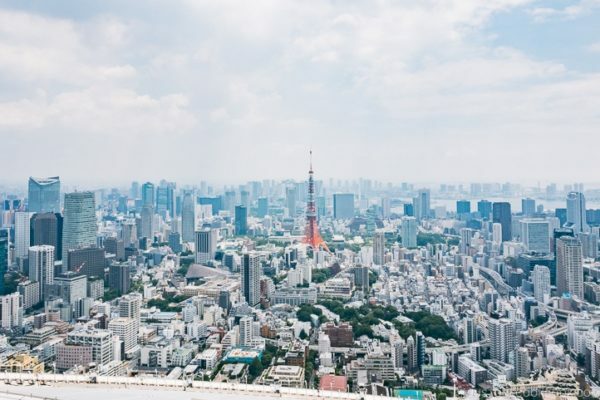 Because people who sit next to you are also sharing the same sauce pot, there’s always an etiquette to observe when you eat kushikatsu (kushiage). The most important rule is no double dipping. 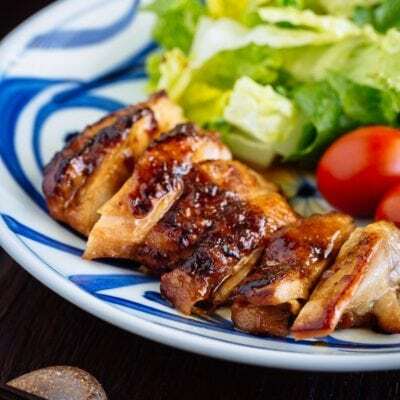 Some kushikatsu restaurants even have instructions in English and other languages to warn travelers not to dip food into the shared sauce pot after you take a bite off the skewers. 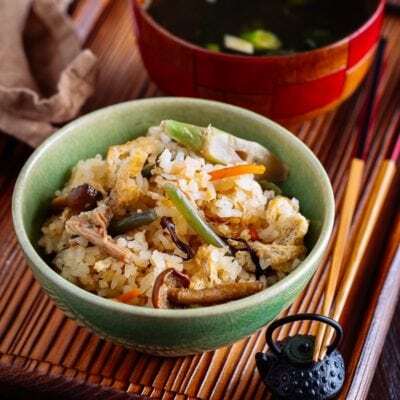 As common sense would apply, putting your food after a bite into a communal pot can be unsanitary and is seen as a bad manner. What if you want more sauce for the remaining kushikatsu? No worries, the restaurants have that taken care of. 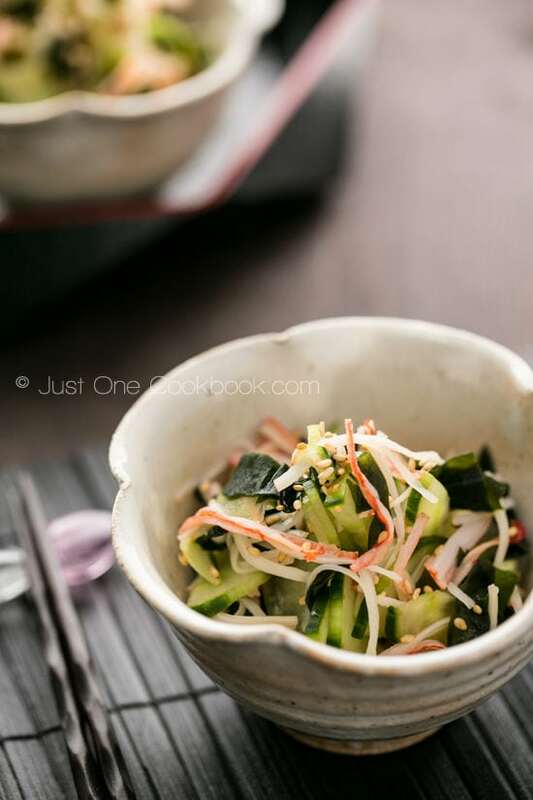 You can use a slice of cabbage served complimentary on your counter and scoop up the sauce from the pot and pour it over your kushikatsu on your plate. 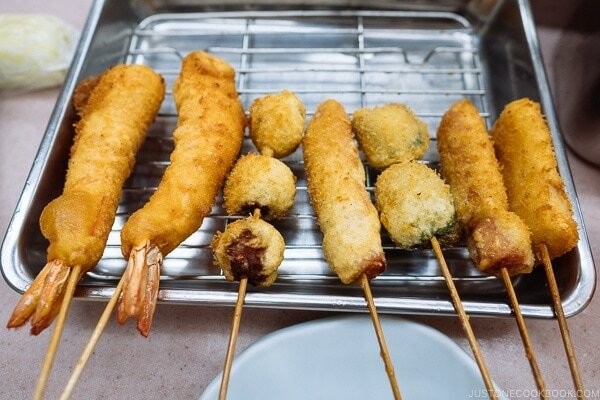 Kushikatsu can be made with all kinds of meat, seafood, and seasonal vegetables. Variety is key, so the list is a long one. 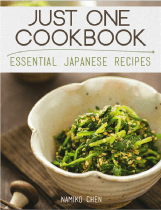 Here are a few tips I have for you when you make kushikatsu at home. To enjoy the maxium flavor of the ingredients, you don’t want thick batter around them. Just enough coating of batter so panko would adhere will do the job. 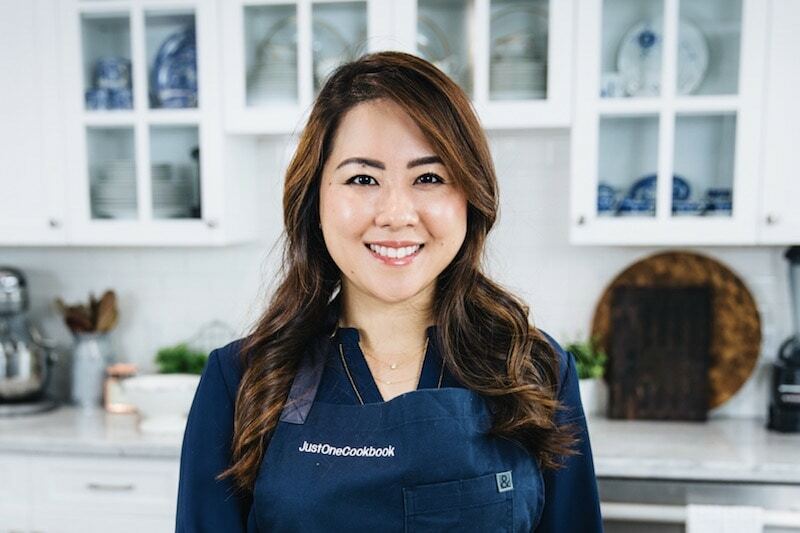 Instead of regular breadcrumbs, you want to use Japanese panko for the best, light, airy, and crispy texture. 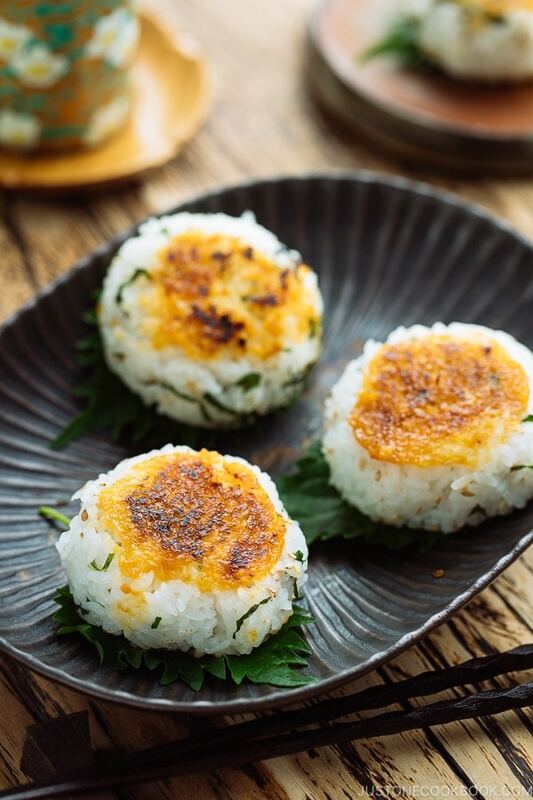 Unlike tonkatsu or chicken katsu, kushikatsu always use very fine panko so we need to use a food processor or put the panko in a bag to rub or use a roller pin to break the panko into smaller pieces. 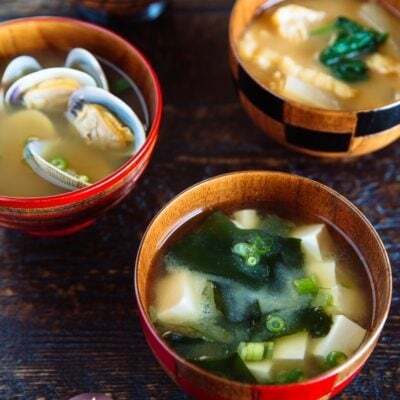 When the oil is hot and ready for deep frying, you want to start with the vegetables or more plain foods first, leaving the meat or strong flavor ingredients for later. 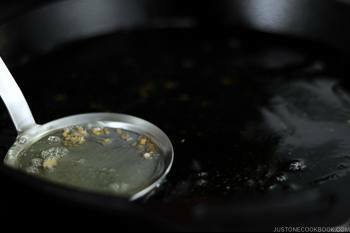 That way, the oil stays clean for the plain food without infiltrating the flavors. 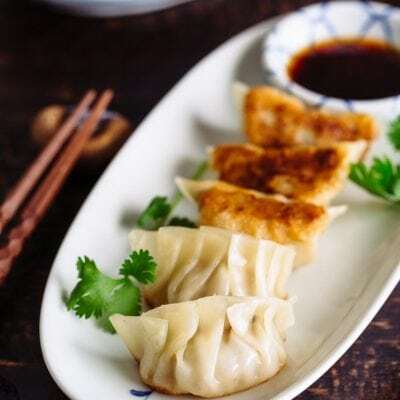 As you get to the savory food, the oil tends to get darker and flavorful toward the end. Kushikatsu (Kushiage) is usually enjoyed with a thin savory sauce similar to Worcestershire sauce. You can mix Worcestershire with other ingredients like what I did here to create your own because Worcestershire sauce alone can be a bit too strong. Mr. JOC feels that he needs a bit of spice, so he sprinkles Shichimi Togarashi (Japanese seven spice) on his skewers to give them an extra boost. 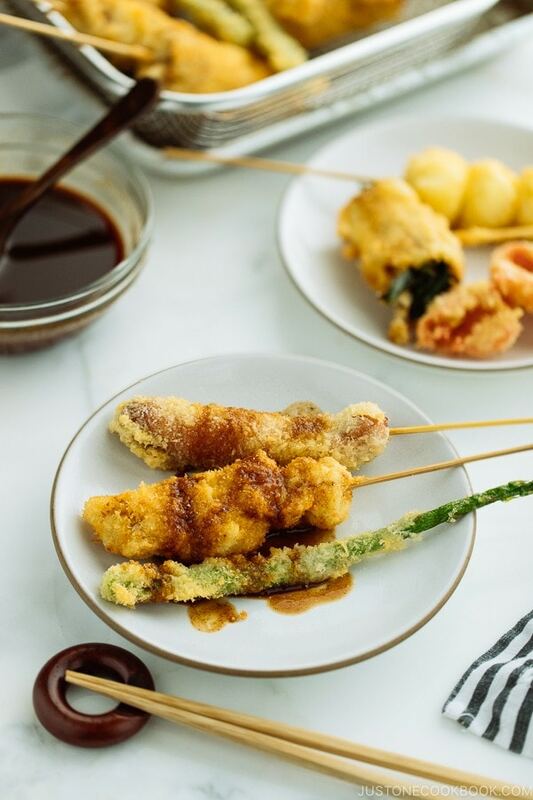 Kushikatsu may not be an everyday meal you’d serve for your family, but it sure makes a special feast on an occasion that worths celebrating. They make a great party food too! Maybe a theme like ‘Street Foods Party’ for any upcoming holiday get-together would be a fun idea. 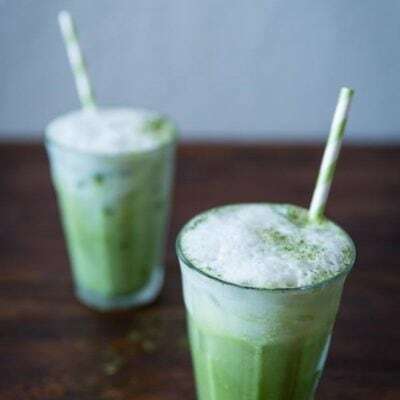 Your guests would be happy to contribute the drinks and desserts and anything else that go well with the feast. Kushikatsu (Kushiage) is also featured in a popular Japanese Drama, Kodoku no Gurume (Season 6, Episode 1). Gather all the ingredients. We will also need a pack of 6-inch bamboo skewers. 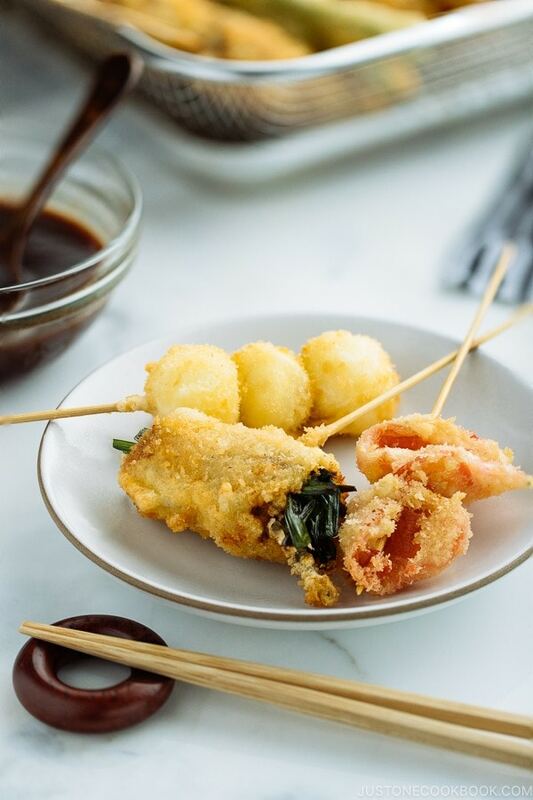 For Kushikatsu Sauce, combine all the Kushikatsu Sauce ingredients in a small bowl and whisk well. Depending on the amount of Kushikatsu, multiple the sauce ingredients as you need. 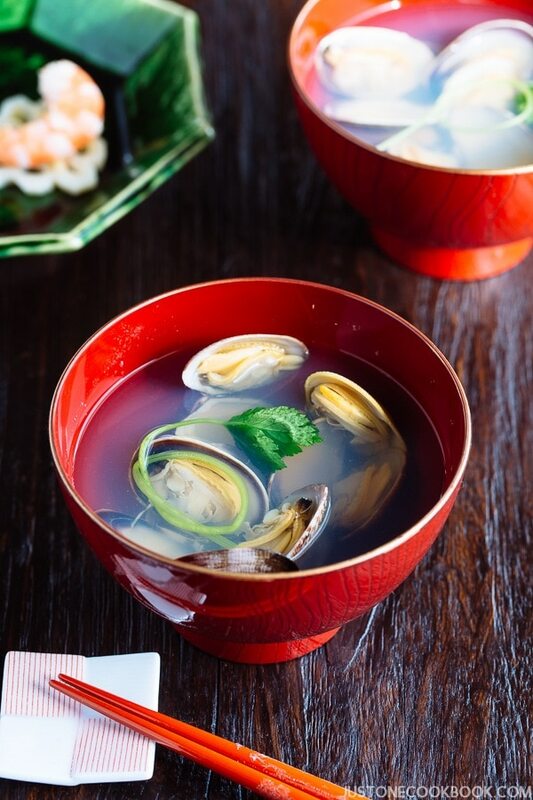 Boil the water in a small saucepan, and gently submerge the quail eggs into the boiling water. Cook for 3 minutes and transfer to iced water to let cool. Peel the eggs and set aside. Put panko in the food processor. Run to make the panko finer texture. Snap the end of asparagus and discard the bottom. Cut ½ onion into 4 wedges. Discard the end of garlic chives and cut them into 4 equal pieces. Cut the pork chop into 4 pieces and pound the meat with the back of the knife to tenderize the meat. Cut the chicken breast diagonally (which should be against the grain) about ½ inch thickness. Then season with kosher salt and freshly ground black pepper. Skewer the chicken and pork as if you are stiching. Starting from one end of the meat, move the skewer downward and upward alternately – like stitching. Equally divide the garlic chives and put them on each end of the four pork belly slices on the cutting board. Roll the garlic chives from one end to the other. Skewer the seam so the pork belly slice will stay in place. 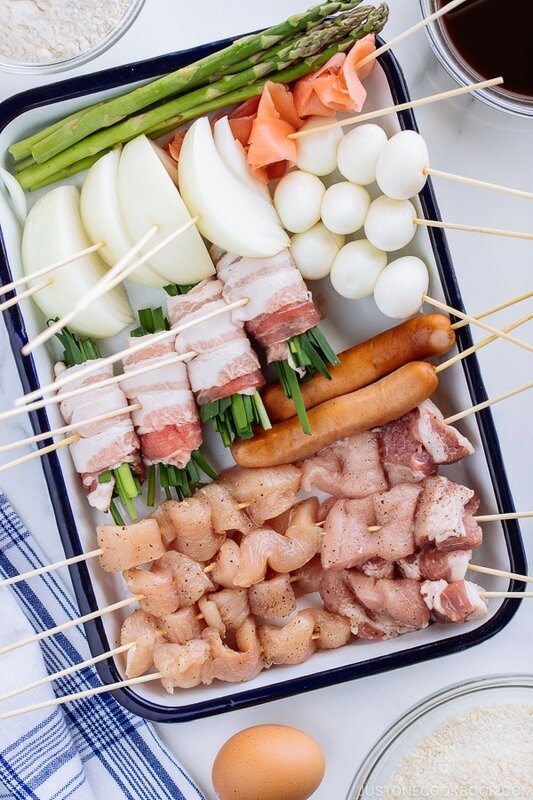 Carefully skewer the sausage and quail eggs. 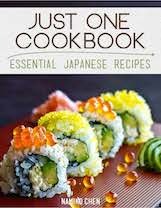 For sushi ginger, drain it and skewer it as well. For onion, skewer it toward the core. 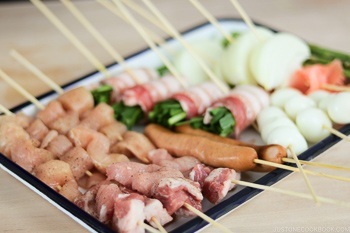 Prepare all the skewered ingredients on a plate/tray. Whisk the egg in a large bowl, and add water, leaving about ¼ cup in a measuring cup. Then add the all-purpose flour into the bowl. Whisk all together. Slowly add the rest of water until you reach the right consistency. 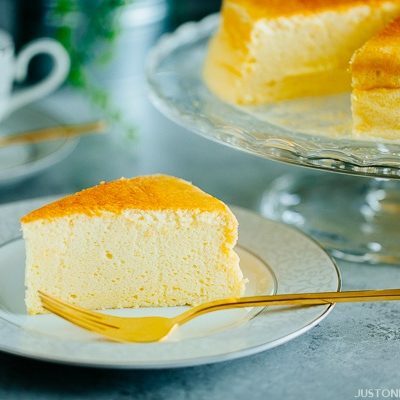 The batter is runny, but thick, when you dip your finger, it should cover with the batter. Place the panko in a shallow bowl/tray. Bring the oil to 340-360 ºF (170-180 ºC). 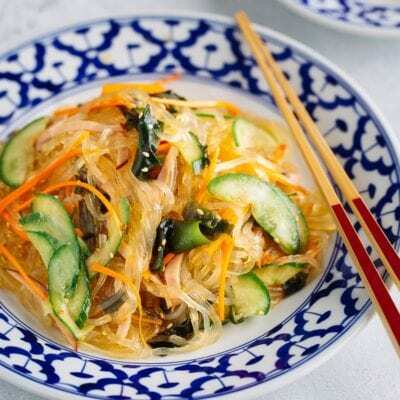 When the oil is hot and ready for deep frying, you want to start with the vegetables or more plain food first, leaving the meat or strong flavor items for later. That way, the oil stays clean for the vegetables/ plain food, and when you start deep frying the savory food, the oil will turn darker and flavorful. Dredge the ingredients in the batter and then panko. Remove excess panko and deep fry until crisp and golden brown. Pick up the panko breadcrumbs between batches to keep the oil clean. Burnt panko will darken your oil, which will change its taste. Continue with other ingredients. 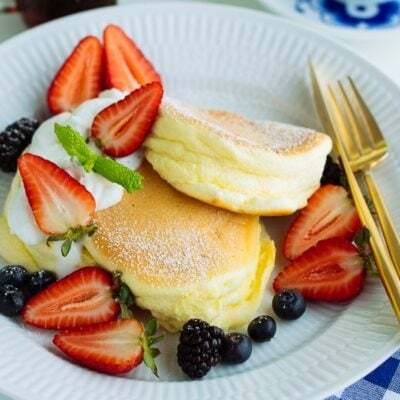 Use a spoon, if you have a hard time coating the batter. Deep fry meat and seafood at the end. Drain the deep fried food on a wire rack or paper towel. 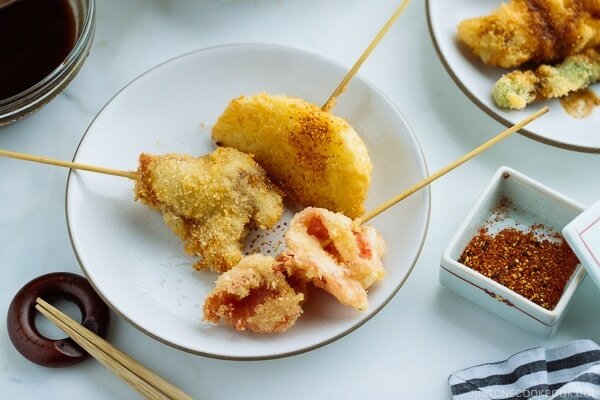 Serve immediately with Kushikatsu Sauce and Ichimi Togarashi (Japanese chili pepper). I love the idea plus it looks so nice. I hope to try it soon. Glad cabbage leaves can be used to scoop up extra sauce. Otherwise I can definitely see how double dipping would be a problem! These look great — thanks. Oh my goodness. 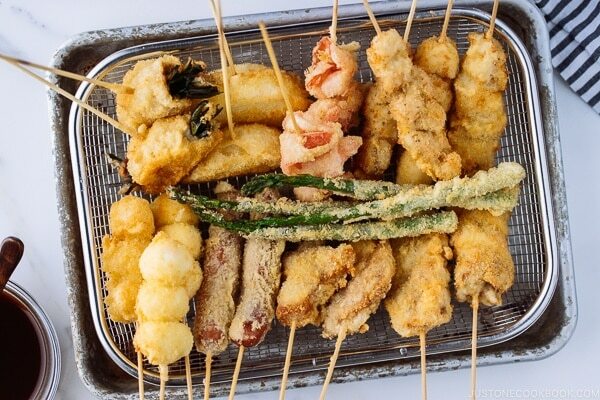 Basically tempura on a stick! That’s pretty much the same tempura batter I use. The dipping sauce is different, though. Looking forward to trying this! Hi Kokujou! Thank you for your recommendation! Several readers requested it, so we’ll include some of the recipes from the show (we won’t be able to share everything though, but we’ll try!). I have never tried the egg trick but it’s very interesting!! !